The test in 2019 will again be officially sponsored by the Saskatoon Gun Dog Club . The test will follow the typical VHDF rules but will be under the auspices of VHDF-Canada. note please make check payable to Saskatoon Gun Dog Club and mail to the Test Secretary with entry form and copy of pedigree once registration opens on May 1. Once the test fills, it will be announced here and a waiting list will be started. Summaries of the tests are available as downloads on the VHDF-Canada webpage and more detailed test rules are posted on the U.S. VHDF website. The age limit for the HAE puppy test is 18 months and it is suggested that the minimum age is about 5 months. There is no age limit for either the AHAE or PE tests. Tracy Fisher and her LM pup Muddy Water's Dora in the 2016 HAE test. Behind, left to right: Al McKim, Field Marshal; Judges: Lawrence Pellerin, Vance Lester, Craig Wilson. Please email Sheila Schmutz (sheila.schmutz@usask.ca) regarding updates to this website. Agenda for a "typical" VHDF Test at Alvena. All dogs will be run sequentially in each test-section, so all handlers need to be present throughout the day. Some wild birds may be encountered as we try to run each dog over new ground in the field. Chukar will be planted in the field, pheasant for tracking and call ducks for duck search. The PE dogs are run in a brace of two in the field. In the field search portion of AHAE and HAE, groups of dogs and handlers may walk along as dogs search one at a time, so bring a comfortable leash and footwear for walking. Weather and terrain may change this to one dog run from the base site at a time. A lunch will probably be provided, for a small fee. We usually have a BBQ supper at the site on Saturday night. 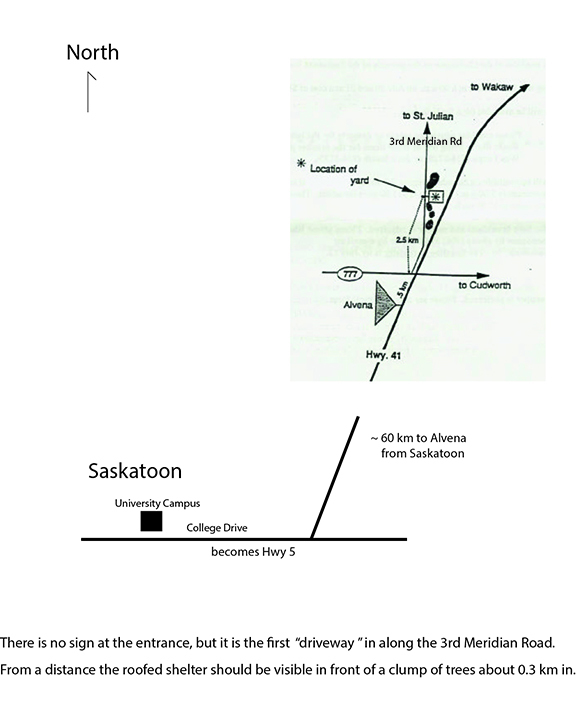 The test site is 2.5 km (1.5 mi) N and 1.5 km (1 mi) E of Alvena, Saskatchewan; or 60 km (40 mi) NE of Saskatoon, along Highway 41. The abandoned farm site includes an outhouse and some shade from trees, and a metal roofed shelter, which can be tarped on the sides if weather is rainy, windy, or cold. There is a firepit and a portable stove will be on the site. A Co-op store with many items and snacks is open on Friday & Saturday from 9 to 6, but not on Sunday. Bring lawn chairs and other items for your comfort. There are no motels or restaurants in the town of Alvena. There are motels about 20 km away in Wakaw and Cudworth. The motel in Wakaw allows dogs in rooms, but the motel in Cudworth does not. If you choose to stay in Saskatoon, we recommend the Heritage Inn for accomodation. It is dog friendly and near the north edge of the city and the airport. It is a "middle class" hotel with an attached cafe. If you are travelling with a RV, there are a few options for RV campgrounds with plug-ins in Wakaw. If you want to park a camper or tent trailer or tent on the test site land, you would be welcome to do so. No electrical plugins are available there. Bring your own water. Visitors are welcome to watch from designated spots. A limited number may be able to walk along. 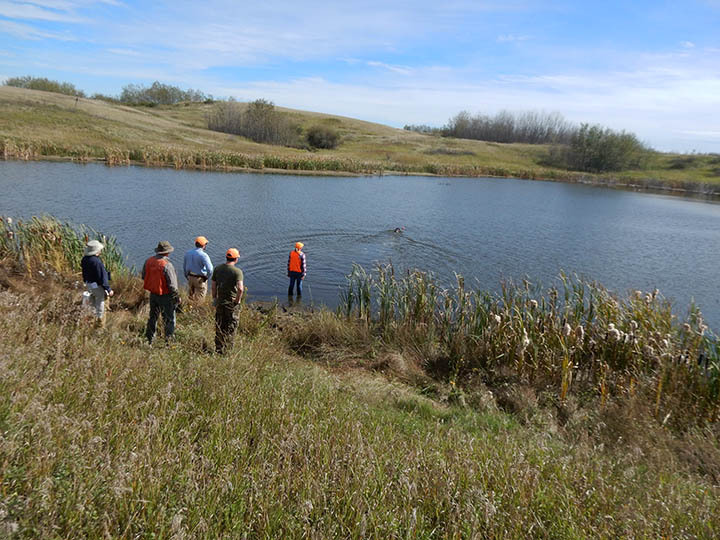 A printable List of the 2018 VHDF-Canada field test scores for the Alvena, SK test can be downloaded as a pdf file. A printable List of the 2017 VHDF-Canada field test scores for the Alvena, SK test can be downloaded as a pdf file. A printable List of the 2016 VHDF-Canada field test scores for the Alvena, SK test can be downloaded as a pdf file. A printable List of the 2015 VHDF-Canada field test scores for the Alvena, SK test can be downloaded as a pdf file. A printable List of the 2014 VHDF test scores for the Alvena, SK test can be downloaded as a pdf file. A printable List of the 2013 VHDF test scores for the Alvena, SK test can be downloaded as a pdf file. A printable List of the 2012 VHDF test scores for the Alvena, SK test can be downloaded as a pdf file. A printable List of the 2011 VHDF test scores for the Alvena, SK test can be downloaded as a pdf file. The scores for the 5 LMs & 1 GWP run in Oct., 2010 can be downloaded as a pdf file. The scores for the 5 LM pups run in June, 2010 can be downloaded as a pdf file. The scores for the dogs run in 2009 can be downloaded as a pdf file. The A printable list of the 2008 VHDF test scores for the Alvena, SK test can be downloaded as a pdf file. The 2007 test was sponsored by members of the Large Munsterlander Club of North America and members of the Saskatchewan Gun Dog Club. Dogs of any hunting breed were welcome.....although from the entries one might not know this. Three dogs were run in AHAE and 10 dogs were run in HAE. The scores for these dogs can be downloaded as a pdf file. Note that VHDF has not set passing scores for any level of testing but leaves this to individual breed clubs. Versatile dogs of any breed are welcome in this test. Many of the dogs entered are often LMs and HAE is considered an "eligible to breed" test, a passing score has been determined. See the page on the LMAC website that explains this in detail.